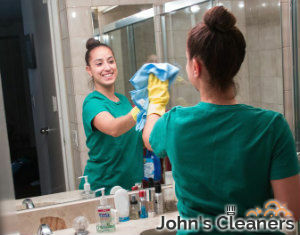 If your bathroom is waiting for you to find the time to clean it, and there is no one else who can help you with your bathroom cleaning, you can call us. We are a cleaning services contractor and we are offering you a very convenient and fairly priced bathroom cleaning service, here in Clapham, SW4. If this sounds like something that will help you and will ease your life, do not hesitate to call us right away. Our cleaners are professionally trained to be able to deal with any cleaning problem there can be in a bathroom. They will cobweb, get rid of mould, soap scum, water stains. One of the worst cleaning problems that every bathroom has is dirty tiles and grouting. We assure you our cleaners will clean them ideally. They are equipped with fantastic grout cleaners and brushes, they will hand scrub them and leave them spotless. They will also clean the mirror, sanitise the sink and bathtub. They will clean the shower cabin or curtain. What is more, our cleaners do not care how many bathrooms are in your home. They will clean ideally all of them, and they do not work with a time limit, but until the job is done. We assure you, our cleaners will disinfect and clean perfectly. And if you hire them for regular maintenance, you will never have to scrub your toilet or bathtub again. Give us a call as soon as possible, so that we can help you. Enjoy our offer – a high-grade bathroom cleaning service for an affordable price and close to you here in SW4. Call us now.